“Vietnam is highly affected by climate change. 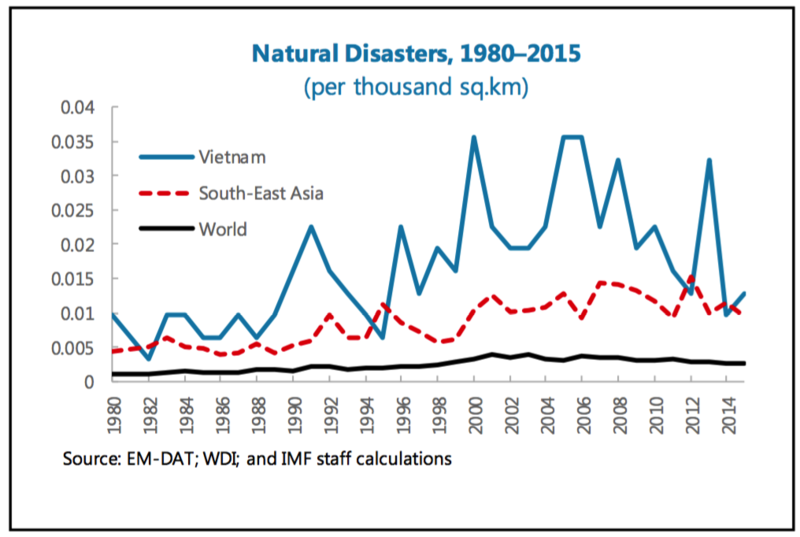 Its long coastline, geographic location, and diverse topography and climates contribute to Vietnam being one of the most hazard-prone countries in the Asia-Pacific region. Given the high concentration of the population and economic assets in coastal lowlands and the significant role played by agriculture and fisheries in the economy, Vietnam is ranked among the five countries likely to be most affected by climate change. Over the last 50 years, temperatures have increased twice as fast as the global average, the sea level has risen by 20 centimeters and the frequency and intensity of extreme weather events (drought, flood, salinization) have risen sharply. Natural disasters result in 470 fatalities and cost 0.8 percent of GDP (annual average between 1990 and 2016).